Editor(s): Rucinski, S. M.; Torres, G.; Zejda, M.
This volume contains the proceedings of a cross-disciplinary science conference that took place in the historic city of Litomyšl in the Eastern Czech Republic on 8-12 September 2014 to celebrate the 100th anniversary of the birth in this city of Zdeněk Kopal, one of the most famous Czech astronomers of the 20th century. The meeting attracted over 120 experts in the fields of binary stars and planets from more than 25 countries around the world. Binary stars and planets form and evolve through processes involving redistribution and evolution of the angular momentum of collapsing interstellar clouds, through several dissipation and re-organization mechanisms. Both types of objects are studied in similar ways, with methods and tools developed by the binary-star community over many years, but now extensively applied to study planets. The theory and observation of these processes are now rapidly advancing and leading to new and exciting results, which made this meeting a timely opportunity for discussion and vigorous exchange of ideas. 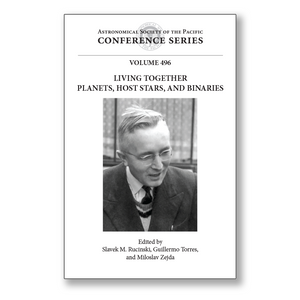 This volume will be of interest to researchers wishing to learn about new observational projects related to many aspects of binary star physics, as well as the discovery and characterization of exoplanets, particularly planets in binary star systems. Included as well are many presentations describing ongoing research on close and interacting binary stars, which was a subject close to the scientific interests of Zdeněk Kopal, as embodied in his monumental monograph "Close Binary Systems" (1959).